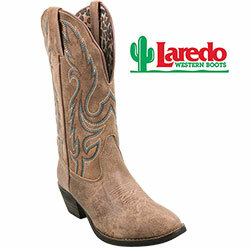 She'll really turn heads when she kicks up her heels in these Laredo Dawn western boots. As comfortable and long-wearing as they are beautiful, they feature an all-sanded leather upper accented with traditional western stitch detail and turquoise accents. Also features cheetah print fabric lining, cushion insole for all-day, all-night comfort, R toe, composition outsole with cowboy heel, pull-on straps and 11" height. Color: Sanded Tan. Womens size 6.